Education Week in Ontario, Mr. & Mrs. Martial Moreau visit their daughter Shirley’s second grade class at St. Mary’s Separate School. 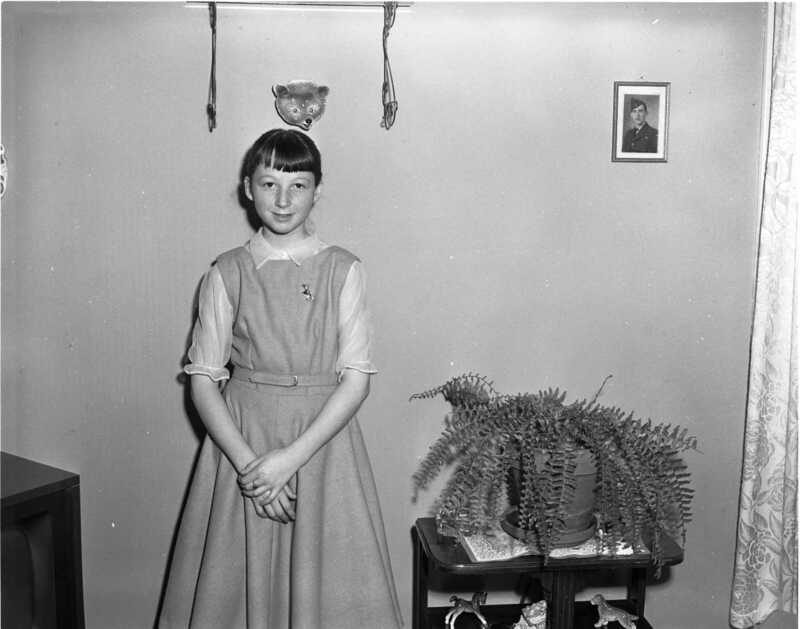 Shirley, 7, is a pupil of Miss E. Curry and her sister Carol, 5, completes the family picture. Free Press sports scribe Charlie Noquet will have to be on his toes with a spelling champ in the house, daughter Vicki, a grade eight student at Sacred Heart, out-spelled students from Midland, Oshawa, Owen Sound and Orillia to advance to the finals. 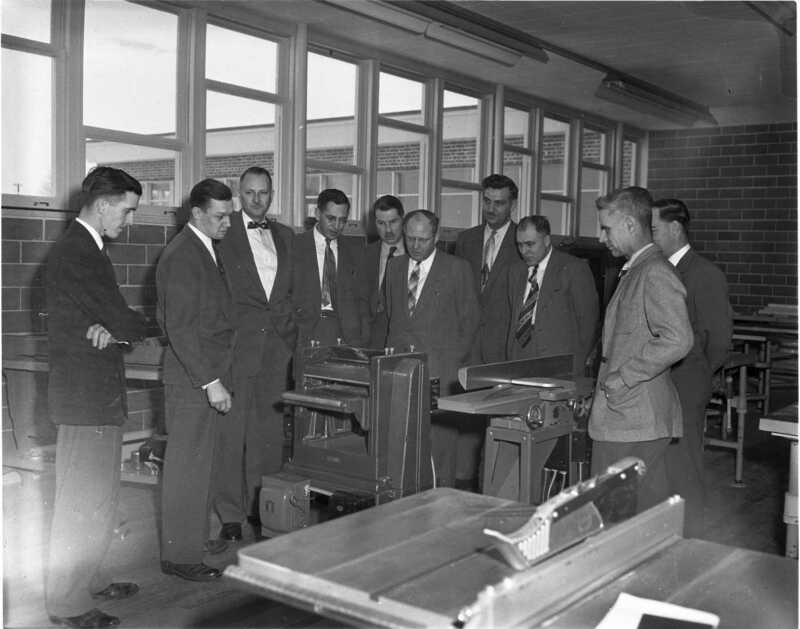 “Talking Shop” comes naturally to these men gathered around a wood planer at the new Midland Penetanguishene District High School. They are all instructors in shop work at various schools in the Georgian Bay District. Jim Warren, Orillia; William Hanna, Midland; Professor Jack Spry, OCE Toronto; Gordon Luther OCE; Don Ritchie, Parry Sound; L. M. Johnston, principal MPDHS; Addison Black, Thornbury; Murray McGill, Meaford; Richard Moffatt, Midland and William Farmer, Sutton. 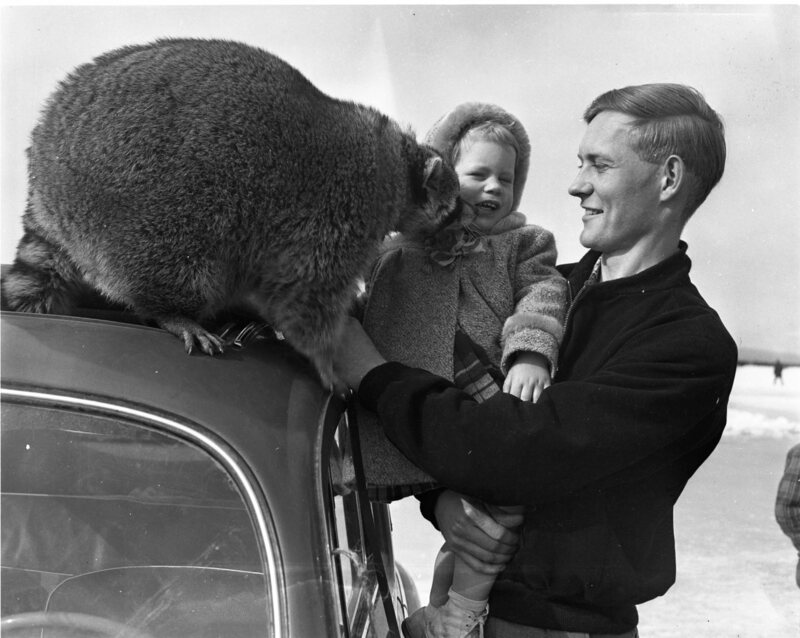 Do you remember the racoon tied to the roof of a car at the Penetang Winter Carnival, hundreds of kids visited the racoon, including three-year-old Darcy Lawson of Bellville. Winning top awards in potato competitions is nothing new for these two Lafontaine farmers, Gabriel Maurice and Roger Brunelle were grand champion and reserve champion respectively at the North Simcoe Seed Fair in Elmvale Friday. 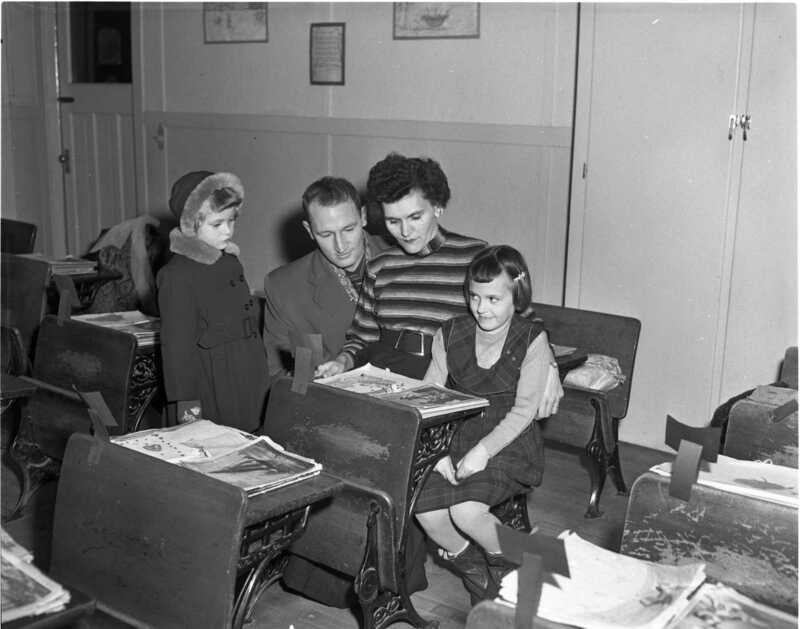 Center is E.W. 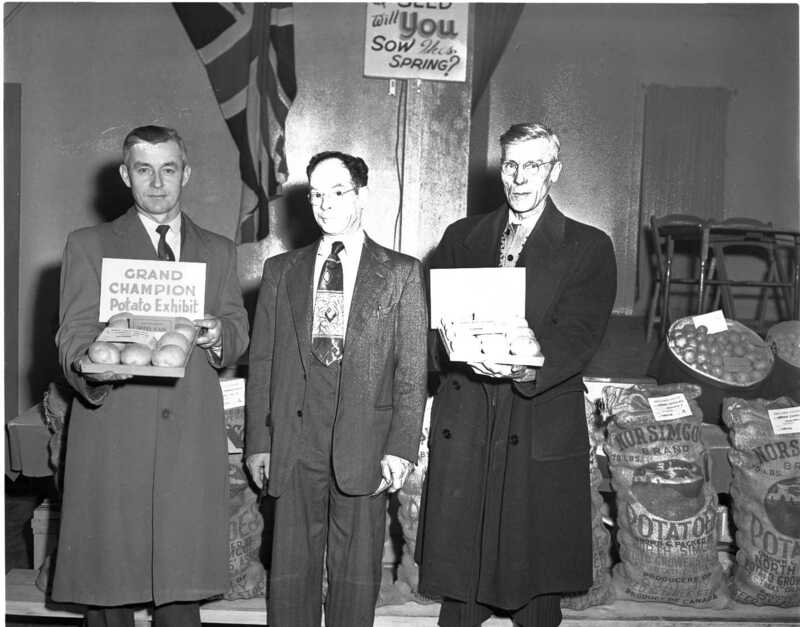 Cuppage, Coldwater, secretary of the Potato Growers Association. 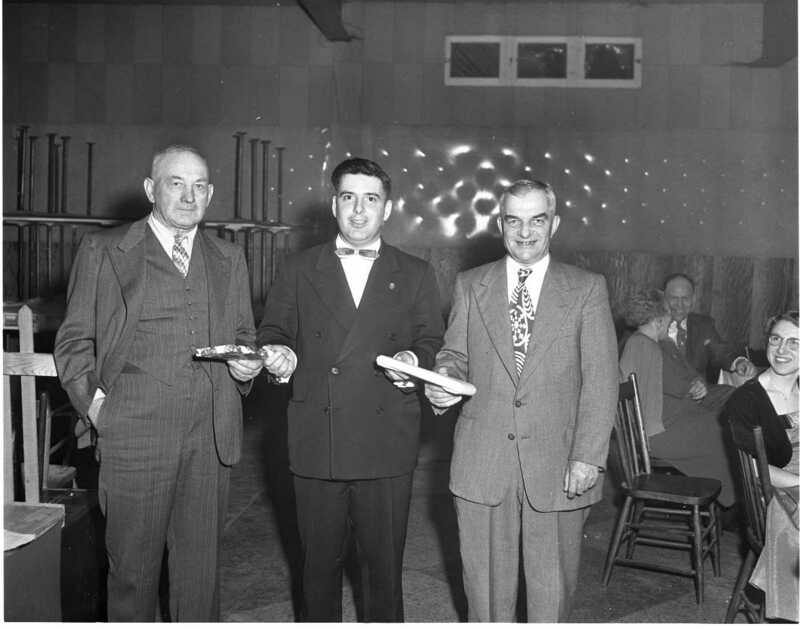 Walter Grexton and Paul Beteau are seen receiving gifts from Bruce Gazley on behalf of their many co-workers and friends who attended their retirement party at the Parkside Inn. 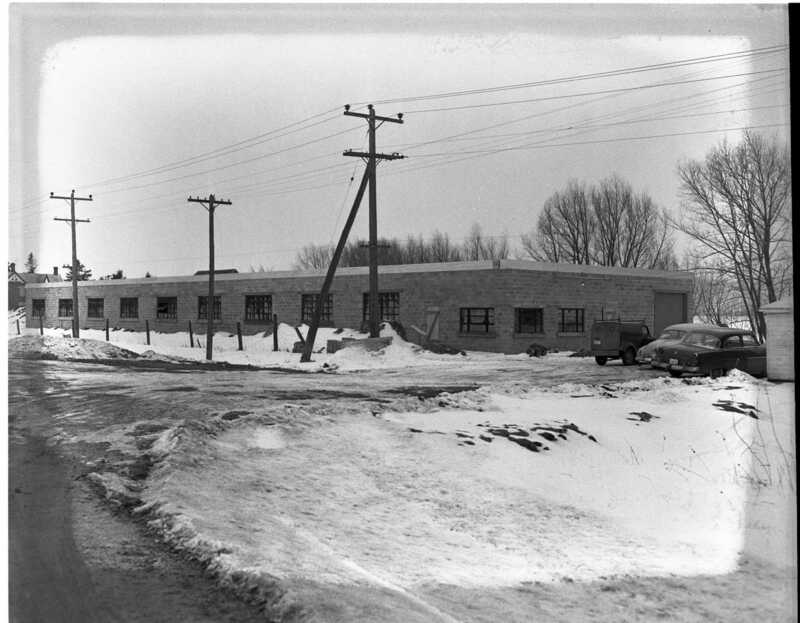 Both men worked for the CNR in the car department in Midland. Octogenarian, Mrs. Samuel Smith of 152 Colborne Street celebrated her 84th birthday on March 6th. 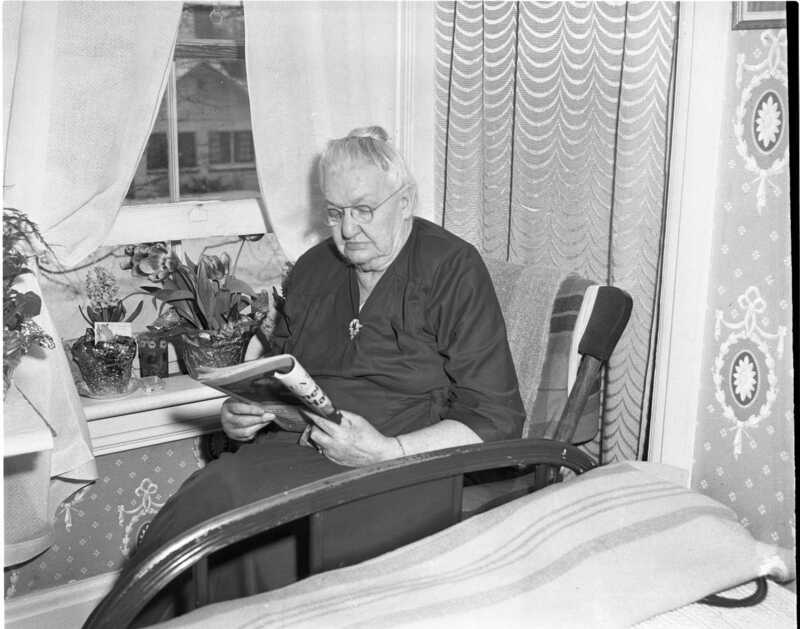 Devoted Anglican, Mrs. Smith is confined to her room after serious heart problems a year ago but keeps in touch with her 13 grandchildren and 13 great grandchildren using an extension phone in her room ( a very new thing in 1956). She lives with her daughter and son in law, Mr. & Mrs. W. E. Wilson. Her son Ivan Smith was recently inducted as an Anglican minister. Local Hunters and Anglers Association alerts Lands & Forest, Simcoe County Health and Port McNicoll Council to the dumping of 3,800 gallons of oil into Port McNicoll harbour by the crew of the Capt. C. D. Secord. Harbourmaster asked the crew to clean up the oil and that has been done. Practice of ships throwing garbage onto the ice will also be stopped. Local girls receive their caps at the Royal Victoria Hospital’s nursing school, Vera Lambie, Sally Ann Bowman and Joan MacEachern of Midland, Reta Brabant and Joan Reynolds of Penetang. Open house at Parkview Public School gives 500 parents a glimpse of the renovated facility. A shortage of water in the Medonte Coldwater area has created a business for Joseph Gratrix of Tay Township. He is daily trucking water to local farms and even communities. In some parts of Medonte farms have no wells and rely on cisterns which are running dry due to the lack of winter thaws. Other operators are working out of Elmvale and Barrie. Professional Services in Midland; Chiropractors – Kenneth S. Lewis, Doctor of Chiropractic – Naturopathy, Electro-Therapy. Dental – Dr. John S. Corcoran – LDS – DDS – Dental Surgeon. Insurance – Lorne A. Ball, Les Taylor. Funeral Director – Nicholls Funeral Home. Legal – Finlayson & Dudley, Onley & Haig, Edward B. Kendall. Monuments – Sanderson Monument Company. Optometrist – A. H. Tweedle, Hugh W. Reisberry. MPDHS sets up new “House” system of student government. Student body is divided into four houses, selected by lot, equal number of boys and girls, each with a captain and vice-captain appointed by staff advisors. The captain and vice nominate a slate of directors which the students vote on. From the Houses grows the Student Council, composed of the four captains and vice-captains and one executive from each house. Patricia Frances Carroll, daughter of Francis and the late Albina Carroll married Ross Willett, son of Mr. & Mrs. William Willett of Parry Sound, in St. Margaret’s Rectory on February 25th. Lands and Forests to wage war on Lamprey Eels in the Sturgeon and Nottawasaga Rivers. OMB to meet in Midland to hear an appeal by Midland Shipyards that may reduce Midland’s tax revenue by $9,400.00. 24 to 30 inches of ice in Midland and Port McNicoll harbours may mean a slow start to local shipping. Earliest recent start was March 28th in 1953 and the slowest was April 27th in 1943. Army reservist is killed when he falls from a set of steel stairs in the St. Catherine’s Armory. Native of Midland, 37 year old Francis (Leo) Beauchamp was the son of the late Mr. & Mrs. Joseph Beauchamp. 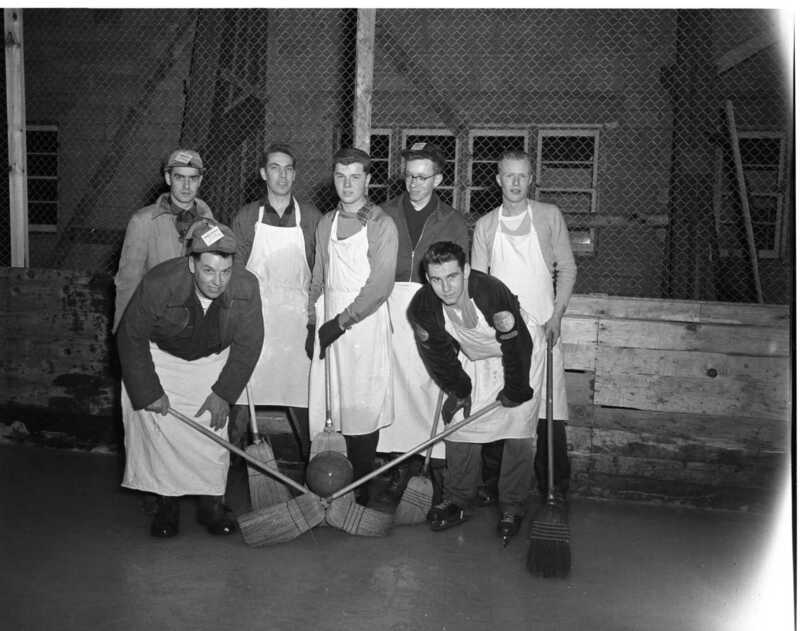 M. Paterson and Sons Steamship division announces captains and engineers for 1956 season; from Midland/Penetang – Altodoc, Captain K. C. Clark. Mantadoc, Captain H. Odesse. Ontadoc, engineer J. R. Smith. Vandoc, Captain D. G. Wilson. Newbrundoc, engineer A. S. O’Hara. Soreldoc, R. Simpell. SS Paterson, Captain T. C. Jewitt formerly of Penetang. Allan W. Perkins, manager of the Roxy Theatre announced today that Odeon Theatres (Canada) Limited has acquired the Roxy Theatre, the Midland Drive-in and the Capital Theatre. No changes are anticipated at this time. A son was born to Mrs. Guenther Leitz, Sunday, March 11, in St. Andrew’s Hospital. He will be named Guenther and is only the second boy born in the fourth generation of the Leitz family.